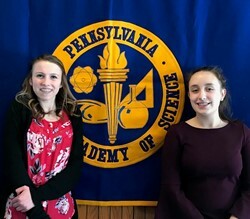 North Hills High School sophomore Hannah Sciulli advanced to the Pennsylvania Junior Academy of Science (PJAS) competition after securing top honors at the recent regional competition. Hannah won first-place honors at the regional competition at Duquense University with her zoology experiment on The Effects of UV Light on the Survivorship of Drosophila melanogaster. She will compete at the state competition in May at Pennsylvania State University. Junior Emma Polen won second-place honors with her ecology experiment on the Effects of Nanoparticles on Daphnia magna. Students designed a unique experiment and were judged on their ability to conduct and convey the results of their experiment using the scientific method. PJAS is a statewide organization of middle and high school students designed to stimulate and promote interest in science among its members through the development of research projects and investigations.